IFA has been doing consumer electronics for far longer than anyone’s called them consumer electronics. (The show dates back to 1924; in 1930, the keynote was given by Albert Einstein, who talked about a newfangled device know as television.) This is the first year that the show’s focus has broadened to include appliances as well as consumer electronics; at first blush, that sounds like it makes a lot of sense. After all, the two worlds are converging, right? 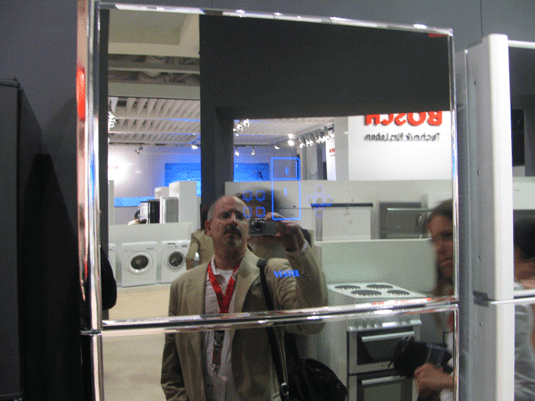 Well, maybe a little bit, but as I strolled the appliance halls at the show today, I was mostly struck by how separate the worlds of electronics and traditional appliances remain. Yes, virtually everything from microwave ovens to irons are packed with sophisticated ciruitry these days. But I had visions of new-wave kitchen and laundry gadgets that sit on a home network and do double-duty as entertainment devices, and I saw almost nothing at the show that even hinted at such a merger of devices in the home. I said almost nothing. Vestel, the Turkish company whose Yoda laptop I already covered, also had a large booth full of kitchen equipment. And it was demoing some concept kitchen/entertainment products which it doesn’t intend to actually sell to anyone. I can kind of see why Vestel isn’t planning to turn these into real products, since none of them look particularly practical. (Especially the dishwasher, unless you’re a midget for whom the TV is at eyelevel.) All the technology exists to make appliances that have consumer electronics-style functionality. But designing ones that make sense is still a challenge. Come to think of it, I can’t think of any examples of anyone succeeding at doing so, unless you cound iRobot’s Roomba.